If you read any boxing blogs at the start of the year no doubt you'll have seen a few “boxers to watch in 2012” lists. There were names common to all of them – Gary Russell Jr, Seth Mitchell and Kell Brook to name a few. And then there's another one, a feature of the 2008 Olympic team and a fighter looking for a world title in 2012. 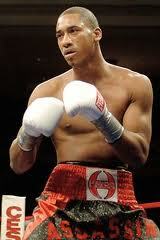 He is Demetrius Andrade, the twenty-three year old light middleweight from Providence. Expectations are a big thing in our sport. Show some skill at a young age, put a good record together and soon you're facing the flashes of cameras and having microphones stuck in your face. Just look at Julio Cesar Chavez Jr and Saul Alvarez; they're under enough pressure to paralyse most people. "Comparing me to an undefeated superstar like Mayweather means a lot to me. To compare us and say I'm in the same path is good. I'm trying to get better and get there." Demetrius also doesn't seem troubled by the amount of media attention he gets. "No. I don't feel pressured at all. All of the pressure is on my opponents. I just do me thing and use my skills." But his skills are developing, and aren't perfect yet. He was recently given another “first” in his career – the first time he has had a fight last ten rounds. He took on veteran Grady Brewer in August last year, a tough pick for a young fighter. "I can't say it was my toughest fight. He's a tough guy but I used my tools, kept him at a distance, and made it an easy fight for me. If I hadn't done those things it would have been a tough fight. Training is the toughest for me. After what I go through training, my fights are easy." "I don't know. It all depends on who has the world title belts. This is a business. If Kirkland or Trout has the belt, they'll be in my path. I'm still young and I don't have to rush. It's hard to say but, whoever has the belt when I'm ready, they'll be in my path." He doesn't seem too phased by fighting either guy, not even Kirkland, whose physique is a test for anyone. "Fighting a guy taller than me, well, I'm not going to give away any secrets, but I won't be leaning in and getting caught, if you know what I mean." "That's funny. I laugh when I hear somebody talk like that. I'm glad he's bringing the hype for this fight. He can go around talking but he better be prepared to back it up fight night." "Thanks for their support and keep believing in me."